Checkered Flag Executive Loaner Fleet Program Car $4,935 off MSRP! 2018 BMW 3 Series 330i Mediterranean Blue Metallic 2018 BMW 3 Series 330i In Mediterranean Blue Metallic, Advanced Real-Time Traffic Information, Comfort Access Keyless Entry, Convenience Package, Head-Up Display, Heated Front Seats, Heated Steering Wheel, Instrument Cluster w/Extended Contents, Lumbar Support, Moonroof, Navigation System, Premium Package, Remote Services, SiriusXM Satellite Radio. 34/24 Highway/City MPG Checkered Flag BMW-MINI - "Where Winners Buy!" Checkered Flag Executive Loaner Fleet Program Car $7,155 off MSRP! 2018 BMW X2 xDrive28i Sunset Orange Metallic 2018 BMW X2 xDrive28i In Sunset Orange Metallic, Advanced Real-Time Traffic Information, Alum Hexagon Trim w/Pearl Gray Chrome Accent, Auto-Dimming Interior & Exterior Mirrors, Auto-Dimming Rear-View Mirror, Comfort Access Keyless Entry, Head-Up Display, Heated Front Seats, Lumbar Support, M Rear Spoiler, M Sport Suspension, M SportX Exterior Package, M SportX Package, M SportX Package (33A), M Steering Wheel, Navigation w/Touchpad Controller, Panoramic Moonroof, Park Distance Control, Parking Assistant, Power-Folding Mirrors, Premium Package, Remote Services, Shadowline Exterior Trim, SiriusXM Satellite Radio, Universal Garage-Door Opener, Wheels: 20" x 8" Light Alloy Bicolor (Style 717M), Without Lines Designation Outside. 31/21 Highway/City MPG Checkered Flag BMW-MINI - "Where Winners Buy!" THIS IS A DEALER FLEET CAR THAT QUALIFIES FOR NEW CAR PROGRAMS. Checkered Flag Executive Loaner Fleet Program Car $9,897 off MSRP! 2018 BMW X2 xDrive28i Misano Blue Metallic 2018 BMW X2 xDrive28i In Misano Blue Metallic, Active Driving Assistant, Advanced Real-Time Traffic Information, Alum Hexagon Trim w/Pearl Gray Chrome Accent, Apple CarPlay Compatibility, Auto-Dimming Interior & Exterior Mirrors, Auto-Dimming Rear-View Mirror, Comfort Access Keyless Entry, Driving Assistance Package, harman/kardon® Logic 7® Digital Surround, Head-Up Display, Heated Front Seats, Lumbar Support, M Sport Suspension, M SportX Exterior Package, M SportX Package, M SportX Package (33A), M Steering Wheel, Navigation w/Touchpad Controller, Panoramic Moonroof, Power-Folding Mirrors, Premium Package, Remote Services, Shadowline Exterior Trim, SiriusXM Satellite Radio, Universal Garage-Door Opener, Wheels: 20" x 8" Light Alloy Bicolor (Style 717M), Without Lines Designation Outside. 31/21 Highway/City MPG Checkered Flag BMW-MINI - "Where Winners Buy!" THIS IS A DEALER FLEET CAR THAT QUALIFIES FOR NEW CAR PROGRAMS. Checkered Flag Executive Loaner Fleet Program Car $8,150 off MSRP! 2018 BMW 3 Series 340i Mineral Gray Metallic 2018 BMW 3 Series 340i In Mineral Gray Metallic, Active Driving Assistant, Advanced Real-Time Traffic Information, Apple CarPlay Compatibility, Driving Assistance Package, Head-Up Display, Heated Front Seats, Instrument Cluster w/Extended Contents, Nappa Leather Steering Wheel, Navigation System, Park Distance Control, Premium Package, Remote Services, Shadow Sport Edition, Speed Limit Information, Sport Edition, Wheels: 18" x 8.0" Fr & 18" x 8.5" Rr (Style 397). 32/21 Highway/City MPG Checkered Flag BMW-MINI - "Where Winners Buy!" Checkered Flag Executive Loaner Fleet Program Car $8,805 off MSRP! 2018 BMW 4 Series 440i Glacier Silver Metallic 2018 BMW 4 Series 440i In Glacier Silver Metallic, Advanced Real-Time Traffic Information, Heated Front Seats, Instrument Cluster w/Extended Contents, Premium Package, Remote Services. 32/21 Highway/City MPG Checkered Flag BMW-MINI - "Where Winners Buy!" Checkered Flag Executive Loaner Fleet Program Car $11,649 off MSRP! 2018 BMW X5 sDrive35i Space Gray Metallic 2018 BMW X5 sDrive35i In Space Gray Metallic, Black w/SensaTec Upholstery, 4-Zone Automatic Climate Control, Comfort Access Keyless Entry, Heated Steering Wheel, Premium Package, SiriusXM Satellite Radio w/1 Year All Access. Checkered Flag BMW-MINI - "Where Winners Buy!" This is a Fleet vehicle that qualifies for all new car incentives. Checkered Flag Executive Loaner Fleet Program Car 2018 BMW 4 Series 440i Carbon Black Metallic 2018 BMW 4 Series 440i In Carbon Black Metallic, Adjustable Front Armrest, Advanced Real-Time Traffic Information, Aerodynamic Kit, Alum Hexagon Trim w/Estoril Blue Matte Highlight, Enhanced USB & Bluetooth, Head-Up Display, Heated Front Seats, Heated Steering Wheel, Increased Top Speed Limiter, Instrument Cluster w/Extended Contents, M Sport Package, M Sport Package (337), M Sport Suspension, M Steering Wheel, Premium Package, Remote Services, Shadowline Exterior Trim, Wheels: 18" x 8" Fr & 18" x 8.5" Rr (Style 400M), WiFi Hotspot, Wireless Charging. 21/32 City/Highway MPG Checkered Flag BMW-MINI - "Where Winners Buy!" Checkered Flag Executive Loaner Fleet Program Car 2018 BMW X5 sDrive35i Sparkling Brown Metallic 2018 BMW X5 sDrive35i In Sparkling Brown Metallic, Ivory White/Black w/Dakota Leather Upholstery, 4-Zone Automatic Climate Control, Active Blind Spot Detection, Active Driving Assistant, Comfort Access Keyless Entry, Driving Assistance Package, Enhanced USB & Bluetooth (ZEB), Head-Up Display, Heated Steering Wheel, Premium Package, SiriusXM Satellite Radio w/1 Year All Access, Speed Limit Information, WiFi Hotspot, Wireless Charging. 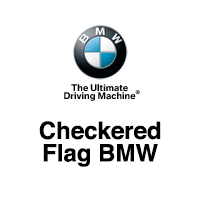 Checkered Flag BMW-MINI - "Where Winners Buy!" Checkered Flag Executive Loaner Fleet Program Car $7,158 off MSRP! 2018 BMW X5 sDrive35i Black Sapphire Metallic 2018 BMW X5 sDrive35i In Black Sapphire Metallic, Black w/Dakota Leather Upholstery, 4-Zone Automatic Climate Control, Active Blind Spot Detection, Active Driving Assistant, Comfort Access Keyless Entry, Driving Assistance Package, Enhanced USB & Bluetooth (ZEB), Head-Up Display, Heated Steering Wheel, Premium Package, SiriusXM Satellite Radio w/1 Year All Access, Speed Limit Information, WiFi Hotspot, Wireless Charging. Checkered Flag BMW-MINI - "Where Winners Buy!" Checkered Flag Executive Loaner Fleet Program Car 2018 BMW X6 sDrive35i Glacier Silver Metallic 2018 BMW X6 sDrive35i In Glacier Silver Metallic, Black Dakota Leather, 4-Zone Automatic Climate Control, Active Blind Spot Detection, Active Driving Assistant, Apple CarPlay Compatibility, Comfort Access Keyless Entry, Driving Assistance Package, Enhanced USB & Bluetooth (ZEB), harman/kardon Surround Sound System, Head-Up Display, Heated Rear Seats, Heated Steering Wheel, Multi-Contour Seats, Parking Assistance Package, Parking Assistant, Premium Package, SiriusXM Satellite Radio, Speed Limit Information, Surround View Cameras, WiFi Hotspot, Wireless Charging. Awards: * JD Power Initial Quality Study (IQS) Checkered Flag BMW-MINI - "Where Winners Buy!"